James Wade produced an excellent performance to defeat Adrian Lewis on night three of the McCoy’s Premier League in Bournemouth. Wade, the world number three, swept past the second ranked player comfortably, recording an average of over 100 in the process. McCoy’s Premier League Darts: Winning Start for Wade! James Wade made a winning start in the 2013 McCoy’s Premier League, claiming a 7-4 victory against Wez Newton. The 2009 winner fought hard to see off Newton, who was making his debut in the competition, as ‘The Machine’ capitalised on missed doubles from his opponent. James Wade has revealed that he is hungry for success and excited for the year ahead as he prepares to face Wez Newton in the first McCoy’s Premier League night in Belfast this evening. The world number three, who has suffered with well-documented mental health issues, admitted that he has rediscovered his passion for darts after a trophy-less year in 2012. 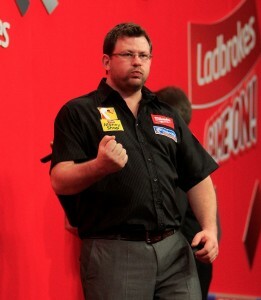 World number three James Wade is appearing at some exclusive non-televised professional darts events in 2013. For further information on how to book tickets to see the second most successful player in the history of the PDC, alongside other top stars of world darts, click one of the event posters below. James Wade moved into the semi-finals of the Ladbrokes World Championship for the second consecutive year after defeating Wez Newton in a thrilling last eight clash at London’s Alexandra Palace. James Wade won through to the quarter-finals of the Ladbrokes World Championship with a straight sets victory over Vincent van der Voort at London’s Alexandra Palace on Thursday. James Wade won through to the last 16 of the Ladbrokes World Championship with a hard fought victory over Steve Beaton at London’s Alexandra Palace on Sunday afternoon. James Wade won through to the second round of the Ladbrokes World Championship by completing a comfortable straight sets victory over Peter Hudson on Monday evening. The seven-time PDC major winner dropped just two legs en route to the triumph, as he set up a last 32 encounter with either Steve Beaton or Kyle Anderson. Wade, who reached the semi-finals at the Alexandra Palace last year, insisted that he can go all the way in 2013. “I didn’t play my best but I beat a good player and I’m pleased to be through,” said the 2012 World Matchplay finalist. “I’m a good dart player and I believe I can win this tournament. I’ve practised so hard for it and I can play a lot better than I did tonight. Wade bedded double two to take the first leg before starting the second with a 180, but Hudson managed to draw level. ‘The Machine’ took out a classy 102 finish to edge back ahead and his second 180 helped him break his opponent’s throw and seal the first set. Hudson took the first leg of set two before Wade took out 76 to square up. The world number three slotted in his third 180 in the following leg, which he won on double ten. Wade then pinned double 16 to take a two set lead. A brilliant 174, followed by a 91 checkout gave ‘The Machine’ the lead in the third set. He pegged double five to move within a leg of victory and he wasted no time in finishing the job, hitting another maximum before cleaning up 56 to seal his spot in the second round. Wade will be back in action on Sunday December 23. James Wade got his first points in the 2012 William Hill Grand Slam of Darts with a comfortable victory against Jan Dekker. The seven-time major winner triumphed 5-1 against his Dutch opponent in Wolverhampton on Sunday evening, to put his opening night defeat to Arron Monk behind him. “I’m so happy to have hit my doubles,” said Wade, who recently took a short break from playing darts for health reasons. “I did enough to win. It wasn’t a million miles away from what I can do. “This week is all about building for the future. The last few weeks have been a very important time since the Grand Prix. Wade bedded double four to take the opening leg but Dekker levelled up on tops. A 177 helped ‘The Machine’ edge back ahead by hitting double top and he then grabbed a break of throw, posting double ten in a leg that saw him miss the bull for a 167 checkout. Another successful dart at double ten moved Wade into a 4-1 lead. And the world number three finished the job, hitting double top to take a the two points. Wade will face Mervyn King in his final group game on Tuesday evening. James Wade has issued a message of thanks for the outpouring of support he has received in the last 48 hours. The world number three, whose mental health issues have been well documented in recent years, was visibly unsettled during his World Grand Prix defeat against Colin Osborne on Tuesday evening. Wade, who immediately flew back to the UK, was diagnosed with bipolar disorder, clinical depression and Attention Deficit Hyperactivity Disorder when he was admitted to The Priory Clinic in 2010. He has continued to receive the necessary treatment to combat his illnesses ever since. “I want to take this opportunity to say a massive thank you to all of my fans and everyone who has supported me, especially since Tuesday,” said Wade, after online fan pages and social media sites were flooded with messages of concern and support.